Our tote bag is made of rugged 100% organic cotton canvas. It will give you many years of use. Use and re-use this machine washable bag as an eco-friendly replacement of paper and plastic bags. Our retro-logo is printed on the side of each bag. 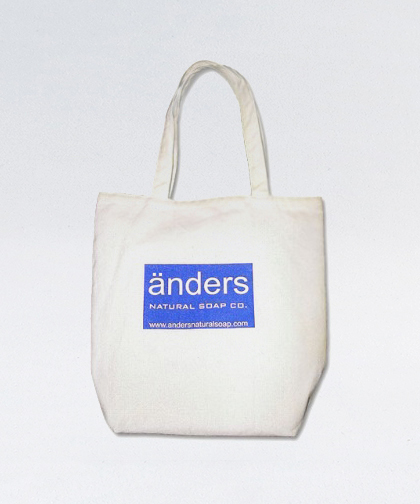 Our Änders Organic Tote Bag is made of 100% organic canvas cotton grown by farmers that eliminate toxic chemicals from their growing process. When asked; paper or plastic, just say neither. Use and re-use as a machine washable grocery bag. The bag has long carry handles that can be slipped over a shoulder to free your hands. Use this bag often as many stores offer cash back dividends when reusable bags are used.